Nearly two weeks after acquiring first baseman Tyler Austin from the New York Yankees, the Minnesota Twins are giving him a shot. The Twins recalled Austin and right-handed pitcher Tyler Duffey from Triple-A Rochester to fill the roster spots vacated by Adalberto Mejia and closer Fernando Rodney. Rodney was dealt to the Oakland A’s on Thursday. Mejia was placed on the 10-day disabled list Friday with a wrist strain. The Twins acquired Austin, 26, as well as right-handed pitcher Luis Rijo, from the New York Yankees for starting pitcher Lance Lynn on July 30. A career .285 hitter in the minors, Austin is hitting .255 with 11 doubles and nine home runs in 35 games and 137 at-bats in Triple-A. 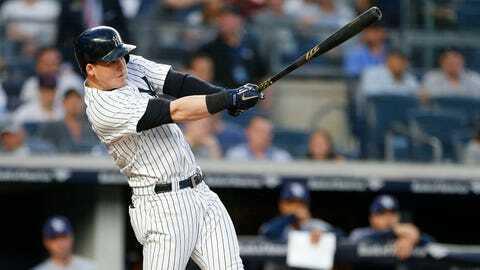 Austin also appeared in 34 games for the Yankees, hitting .223 with eight home runs and six doubles in 121 at-bats. The Twins have deployed veteran Joe Mauer and new addition Logan Morrison at first base for much of the season. However, third baseman Miguel Sano started at first Thursday with both Mauer and Morrison out of the lineup. Mejia made his season debut in late June, and has started four games for Minnesota this season, while pitching three innings during one relief appearance. The 25-year-old has a 2.01 ERA in 22 1/3 innings for the Twins, and a 3.32 ERA in 14 games (11 of them starts) and 62 1/3 innings for Rochester. Duffey has made seven appearances for the Twins this season, allowing 11 hits and nine runs in 11 1/3 innings. The 27-year-old has a 2.72 ERA in 27 relief appearances and 53 innings for Rochester.